Installing a carpet is a fairly straightforward home improvement project that can have a huge impact on the aesthetics of a room. Depending on the type of material on the floors currently, you may need to proceed differently. But, generally, most carpeting projects follow the same steps. Before undertaking the installation of carpet in a room of your home, determine the square footage of carpeting you'll need. You can calculate this number by multiplying the length of the room by its width. It's a good idea to add an extra 10 percent to your total to account for possible errors in cutting or miscalculations. Next, clean the subfloor. You'll want to remove any substances that are sticky or that might start to smell over time. In addition, be sure you let the subfloor dry completely before covering it with carpet to prevent the accumulation of mold. If possible, remove doors to keep them out of the way during carpet installation. Next, install tackless strips. If you'll be installing the carpet over a concrete subfloor, use masonry tacks to hold the strips in place. Next, lay the carpet pad down without overlapping any of its edges. You should lay the pad perpendicular to the direction you plan to lay the rug itself. Trim the carpet to size and attach it at the seams. Use a knee kicker to attach the carpet, one edge at a time. Finally, trim the edges. In some instances, you may wish to cover existing flooring with carpeting. 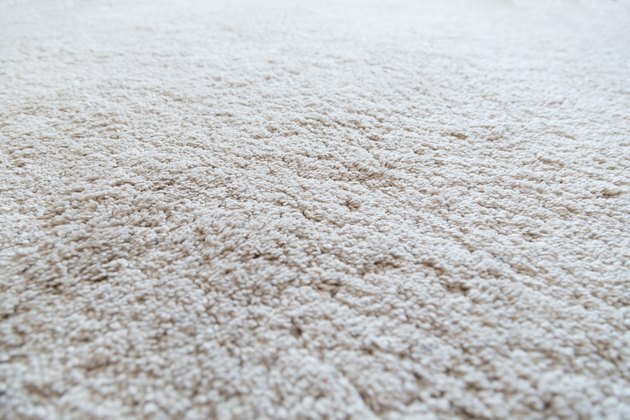 Perhaps you prefer the look and feel of carpet or are hoping to update the look of a room. Before you proceed with the installation of carpeting, however, there are several things to consider. Depending on the material covering your floor currently, it might be in your best interest to first remove that substance, then install carpet directly onto the subfloor. For instance, if you have laminate flooring, it's best not to cover it with carpeting as the tack strips used to adhere carpet can wrinkle the laminate and make it uneven. If the laminate beneath your carpet doesn't lie flat, you may run into difficulties getting the carpeting installed properly. In addition, laminate tends to stiffen and curl up over time, which could push up on the carpeting and cause displacement. Instead of installing carpeting over laminate directly, remove the laminate first. Then, use tack strips to install the carpeting directly to the subfloor. If you plan to install carpeting over hardwood, there's no reason you can't use the wood floor as your base. Begin by installing tackless strips along the perimeter of the room. Be sure to leave enough space between the strips and the wall so that two-thirds the width of the carpet can fit. Next, lay down rug pads everywhere you'll be laying carpet. Cover seams between rug pads with duct tape but do not overlap them. Cut the carpet so that it's between 4 and 6 inches larger than the size of the room. Lay it down so that its pile or pattern is moving in the same direction. Use seaming tape to join the carpet at each seam. Use a knee kicker tool to hook the carpet to the tackless strip at the edge of the wall. Use a power stretcher to stretch the carpet to the opposite wall. Finally, trim any excess carpeting from around the perimeter of the room. You can use a metal strip in the doorway to hold the carpeting in place.